Slice a multitude of olives, cherry tomatoes, grapes and other small fruits and vegetables with a single pass, while the Rapid Slicer holds them in place. Saving you time. 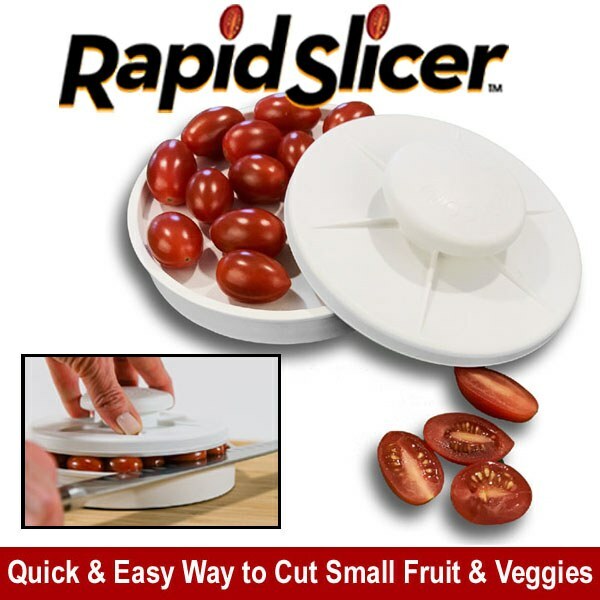 The Rapid Slicer is designed for slicing a large quantity of small fruits and vegetables such as cherry tomatoes, grapes and olives in half quickly and safely. The unit&apos;s large capacity can hold up to 2 cups of cherry tomatoes, grapes or olives at once. Easily adjusts to the size of items being sliced allowing larger tomatoes, grapes and other small produce. Another great use is slicing meats, such as chicken breasts into thin, even cutlets! It is also the perfect aid to assist people with arthritis or poor hand strength. Easy to use. Place fruit or vegetables in base, place the lid over food. Carefully run knife between base and lid to slice your fruits or veggies in half. Enjoy! Non-slip feet keep it stationary on the counter while you slice. Large capacity can hold 1 1/2 - 2 cups of tomatoes, grapes or olives or two chicken breasts at once. Also, great for making thin, even slices of shrimp, chicken breasts and other meats. Easy to clean design is top-rack dishwasher safe. FDA approved kitchen grade BPA free material, safe for food contact.